I love the feel of a clean home. It’s relaxing and nice to have everything fresh and “new”. The daunting task is actually doing all the chores required. Where do you even start? 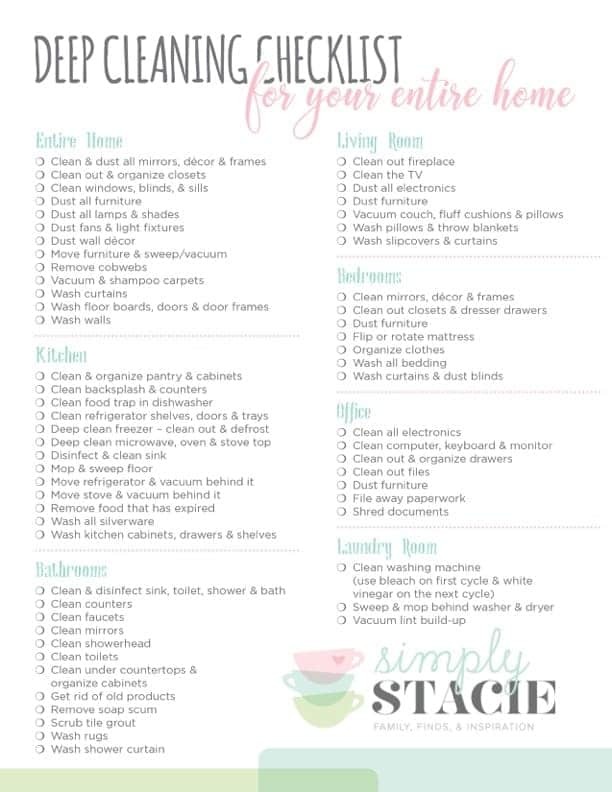 I’ve got a free printable for you today – a Deep Cleaning Checklist for your entire home! It covers all rooms in your home and the major tasks in each one. Print off a copy and poke away at the chores. I don’t think it’s possible to get it all done in one day – kudos to you if you can! However, it’s doable over a number of weeks, I think! Fill out the form below and grab yourself a copy. Happy cleaning! thanks so much for the check list on cleaning clever idea! If you fill out the form in the post, the checklist will be emailed to you. email me at [email protected] and I can send it to you if it doesn’t work. Great list, perfect for fall cleaning that is coming up. helpful list to go by to make sure everything is cleaned.